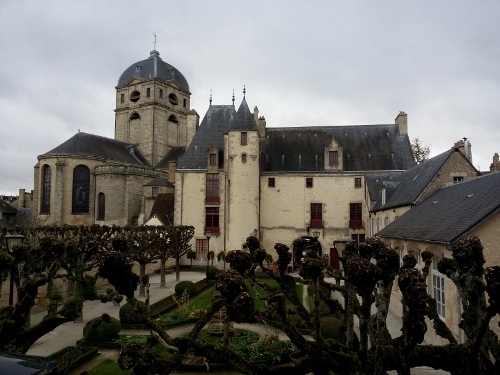 We have been to Lisieux for the third time already. The first time was about 10 years ago (2005), the second time was last year (2014), and the third time is this year, October 2015. For a normal Catholic believer is that too much, that is why we considered ourselves very lucky, blessed and privileged to have experienced this. 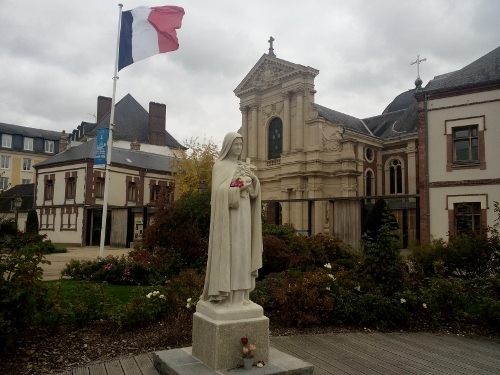 Also this time, before we embark on our second big tour in the South, we stopped by Lisieux to ask the intercession of St. Therese to guide us in our journey. 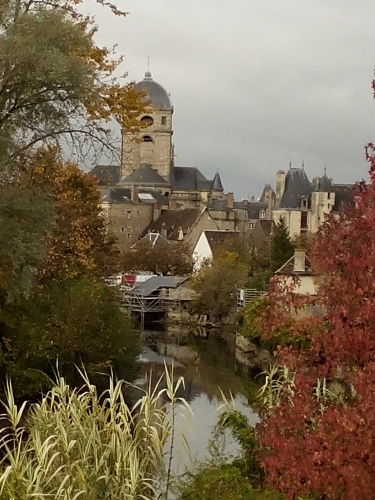 This time, our visit didn’t end in Lisieux; we drove further to Alencon, the hometown of the Family Martin. 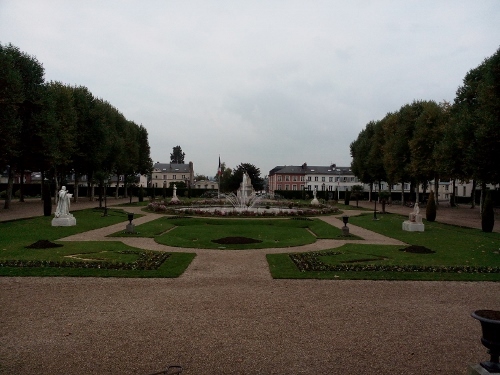 After driving about 700 kms and having a short stopover at Amiens, we finally arrived in Lisieux. The weather was not so fine; it was foggy and cold. But thank God, the drive was uneventful. 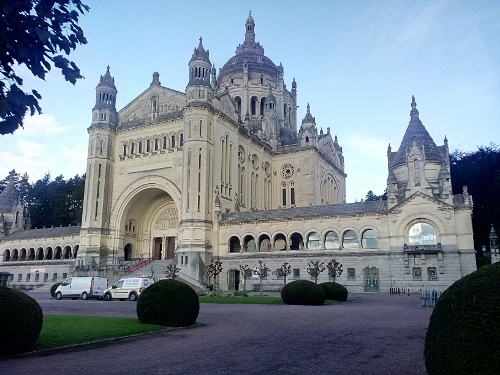 It was 14.00 in the afternoon of October 19 when we finally parked D’Traveller at the parking beside the Basilique of St. Therese. There were about 5 other RVs that were parked at that time. After having a quick lunch, we went immediately to the nearby basilique for a visit. We arrived a day too late for the canonization of St. Therese’s parents and a few days too early for the celebration of the new saints. Constructed in 1929, blessed in 1937 and consecrated in 1954, the Basilica of St. Therese is one of the biggest churches to have been built in the 20th century, and is one the most impressive religious buildings we have ever seen. Aside from its size, what makes it unique and outstanding is the millions of mosaic decorations in the basilique. 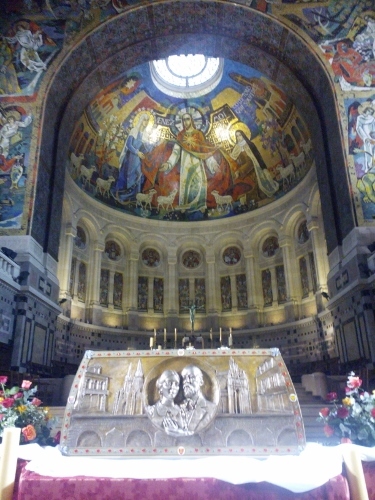 The message of St. Therese and her life are displayed in the basilica by way of the mosaic. There is a big altar of adoration for the saint where a relic is also displayed. At the time of our visit, the reliquary of the newly canonized Saints Louis and Zelie Martin, the parents of St. Therese, are displayed at the altar (before they were found at the crypt). It was different religious experience having been able to venerate the reliquary of the new saints. We were glad though, that we arrived the day after the canonization, then it was a lot quieter and we had more time to reflect and pray. 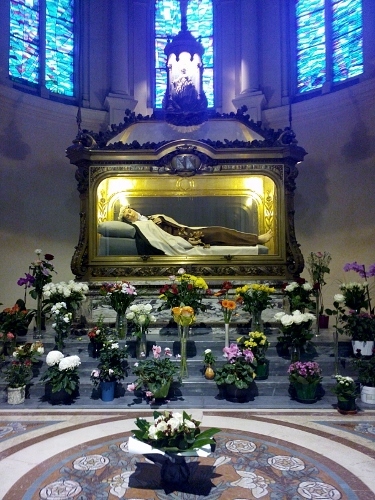 Found at the left wing of the basilica is a small wax museum where the life of St. Therese is presented. Entrance to this museum is free, only a free gift is asked. We entered this museum, received an earphone for a guide, and toured the museum for less than half an hour. Going out from the museum, we went to the Pastoral Center which is situated infront of the basilica. There is an exposition here of the lives of the Martin family, including a family tree. It is just too bad that the descriptions were all written in France. Anyway, it was also comforting to just walk around the center and look at all the pictures and memorabilia. Mini-statue of Saints Louis and Martin which was offered by the St. Therese Sanctuary in the Philippines is prominently displayed inside the center. It is for me a great joy and pride in seeing this statue. Having explored the center, Hans and I went for a stroll around the basilica. We went at the back side, where the images for the stations of the cross are found. 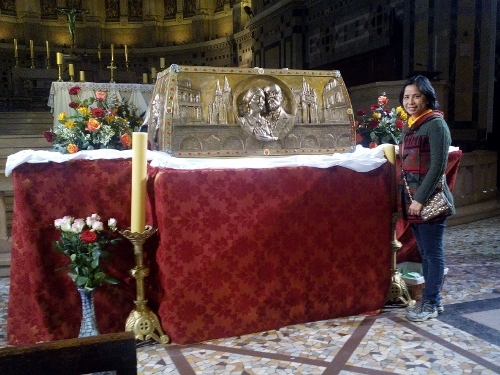 It was here that the parents of St. Therese were buried, then the bodies were exhumed, the relics are now displayed at the altar of the basilica. Our being in the basilica gave us a different kind of religious experience; we were filled with a sense of peace and comfort, contented in the knowledge that St. Therese is with us in our lives and in our journey which we are now making. The city of Lisiux is primarily famous as the town of St. Therese. As such, it is, by no surprise, one of the pilgrimage places for us Catholics. 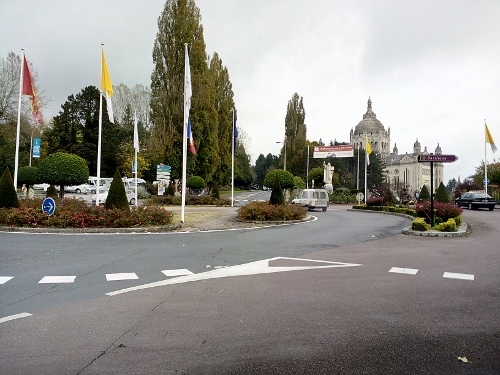 As such, there is a prepared walk around the city which takes one to the major places familiar with St. Therese. The walk takes about a couple of hours and is easy to follow. 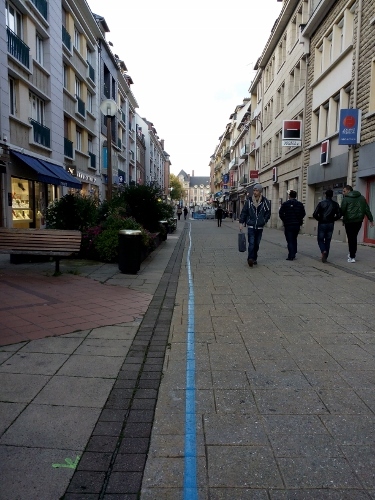 You just follow a blue paint found around the city. You can start the walk at any point, there’s no problem. Because we are already parked near the basilica, it was logical that we begin our walk here. Following the blue line, we came to the Carmel Church and Convent. 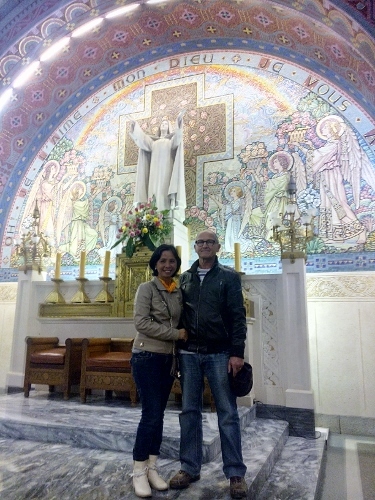 We stopped here to honor and venerate the Shrine of St. Therese which was found at the right wing of the chapel. Afterwards, we visited the museum at the left side. It narrates the life of the saint during her years in the convent. There is also a special place where the objects of gratitude from different devotees are to be seen. We ended our stay here with a short visit at the shop where I bought a small bracelet made by the Carmelite sisters. 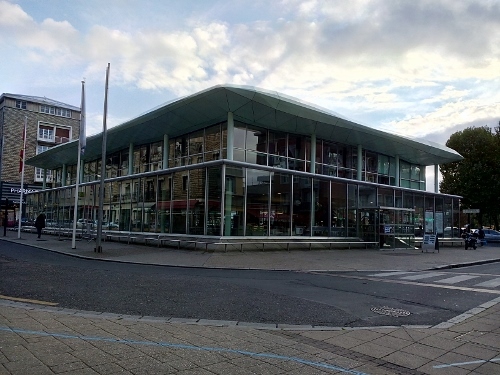 Afterwards, we passed by the Mediatheque, a kind of public library in the city. Here you can have internet access; just feel free to enter . 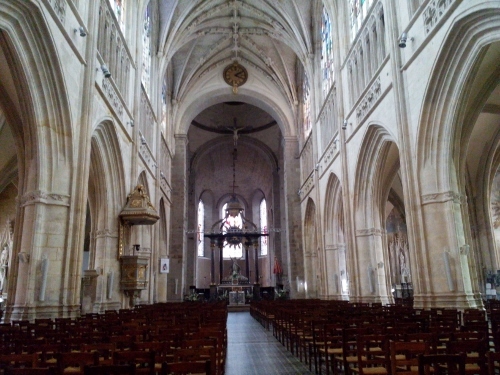 About 300 meters, walking through the shopping street, we, arrived at the Cathedrale Saint Pierre. It is big Gothic religious building from the 12th century where St. Therese was baptized. We were able to hear the mass here accidentally the previous day when we went here also. Walking through, we passed the big Episcopal garden. After about 15 minutes walk, we finally arrived at Les Buissonnets, the house where St. Therese lived from the age of 5 until she entered the convent at age 15. 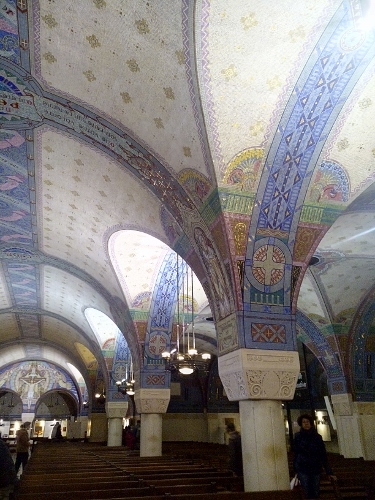 Still following the blue line, we returned to the basilica, just in time to attend the Holy mass at the crypt of the basilica, by far the most beautiful crypt we have ever seen. The following day, it was still a little dark and cold when I walked down to the Carmel chapel to attend the mass. The city was still sleeping, except for a few men who were already working on the fence of the basilica, preparing it for the big celebration the coming weekend. Normally it takes about 10 minutes to get to the convent. But I have already discovered a shorter way, so it took me only 5 minutes. I arrived 15 minutes before the mass started, giving me ample time to have my private conversation with St. Therese. I am your sister and your friend, I shall Always be watching over you”. It was very comforting, peaceful and reassuring moment. Only me and St. Therese, and no one else. My eyes were closed, I was deep in prayers, not noticing that time passed by and the mass was about to begin. The small chapel was surprisingly almost full with massgoers. About 15 nuns were seated in front, and we, the laity at the back side. 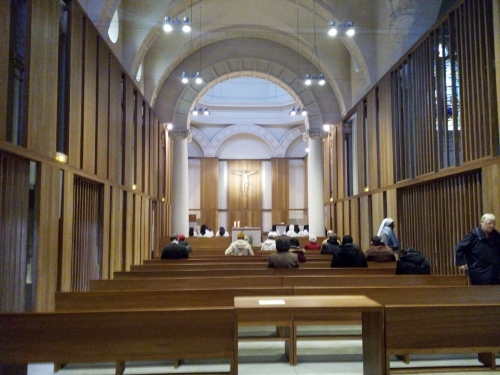 Three priests were giving the mass. Even though I couldn’t understand a thing, it was still a special experience to be there. It was 10.00 when I got back to the camper. Hans was already up, we drank coffee together. Afterwards we visited the basilica one more time. 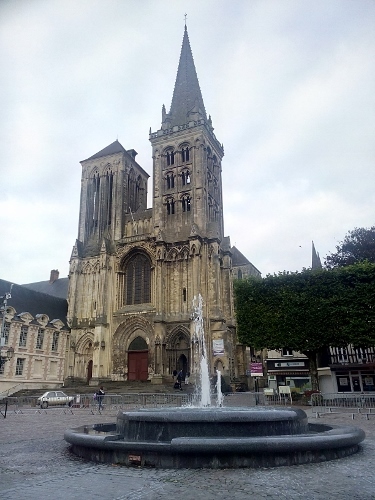 After a couple of hours, our stay in Lisieux is over….but the pilgrimage continues to Alencon. From Lisieux, we drove another 105 kilometers to get to Alencon. We couldn’t find the camper parking area, but luckily we found another parking which is about 300 meters just outside the city center. 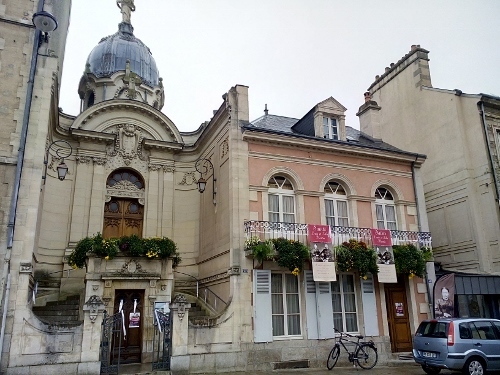 It was already 3 pm, when we arrived in Alencon; we went directly to the tourist office which is found at Maison d’Oze, for some informations and afterwards spent the rest of the day just doing some windowshopping. We planned to take a discovery tour of the city the following day. The next day, being a Thursday was a market day in Alencon. So instead of touring the city, we decided to first go to the market. It was just a small one, but with enough supplies for the city. We bought some fish and vegetables, and went back to the camper for lunch. 12.30, we went back to the city to do the discovery tour. Because the house of the saints Martin would not open till 14.00 pm, we modified the tour in a way that we would reach the house when it is already open. Beginning from the Cathedral where Sts. Louis and Zelie got married and St. Therese was baptized, we did the reverse from the walking tour and began with the last point. It was a bit difficult, reading the walking map the other way round. Along the way, we passed many interesting places, such as the bridge where Louis and Zelie first met, the building Maison dÓze where Zelie learned the art of lacemaking, the municipal building where they married, and the former shop of St. Louis. We also saw some interesting buildings and houses such as the former hospital, the city library (which we entered and got impressed with its awesome woodpanel), the justice palace, La Halle Bleu, chateau des ducs and its tower, and also a big park or esplanade. It was about 15.30 when we finally reached our final destination…the house of the family Martin at Rue St. Blaise. 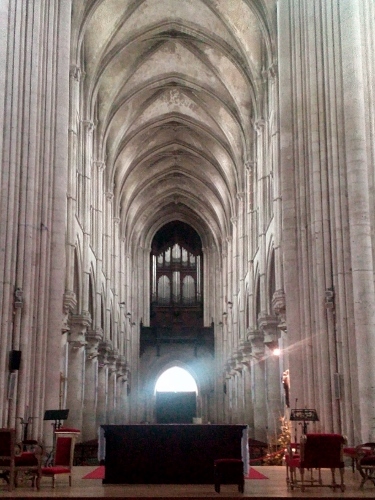 It was the highlight of our tour and the fitting finale of our visit to Alencon. There is no entrance fee, but what was a bit disappointing was every visitor is asked for a donation of 5 euro per person. For us, it was not good because how can you put a price to a donation? A donation should be a free gift, no price attached. Anyway, we have come this far, and it was part of our pilgrimage and we wanted very much to visit the house and the chapel. So after a difficult conversation with two nuns who do not speak English and giving the donation, we went inside. The hall has a exposition of the family Martin and a few personal belongings are also displayed. There is a short documentary about the letters which Zelie made during the years 1872-1877 until her death. Afterwards, we toured the house with a nun, seeing some original furnitures and rooms the family has had. The last room that we saw was the couple’s bedroom, wherein the crib of St. Therese still stands. Afterwards, we had the chance to say a little prayer at the chapel adjoining the house. This chapel was built between 1925 and 1928. After these visits, wehave gained a deeper knowledge of the lives of the saints, especially Hans. I think there is no other ordinary man who knows so much about the lives of the martins than Hans. He is fully converted. 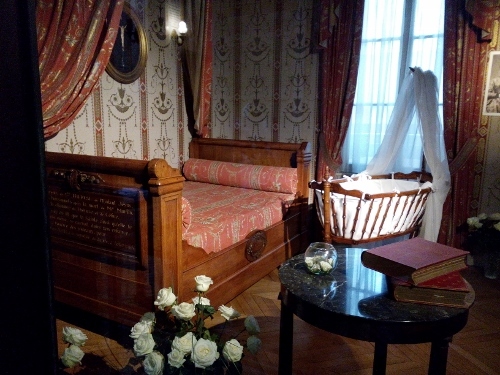 The room where St. Therese was born, with her crib. 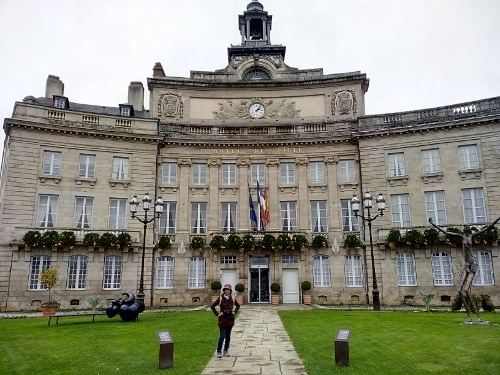 Our pilgrimage to these two towns of Lisieux and Alencon has given us both a feeling of confidence and peace of mind, hoping and knowing that we are blessed with our lives and our love for each other. It has also taught us four important virtues which we have almost forgotten : Love, Simplicity, Determination and Humility. Just like St. Therese, may we always reminded that although we are just like insignificant grains of sand in a wide desert, we too are important in the eyes of God. Just like St. Therese, may we always be reminded that even simple things could lead to great things; and that simple living gets you closer to the love of God. And last, just like St. Therese, may we be always guided by our determination to discover more in life, to love our families, friends, and each other more, also the people who are strangers to us, though it may sound so idealistic. We try our best, with God’s help. Hi, there. You have a very informative narration of your journey/religious pilgrimage. I think that you and my wife will surely click as you have very similar religious values. Like you, she’s deeply religious (me, to a certain extent), that whenever we were in Europe, the first thing she would look for in the city that we’re in would be the church. I remember when we were in Segovia last April that she would take a break during our sightseeing to find a church so we would be able to attend mass either on that day or the day after. We asked anyone around the church vicinity regarding mass times when there was no posting of mass schedule outside the church. In Segovia, we ended up attending a very early morning mass at the nuns’ convent when the whole city was just waking up. 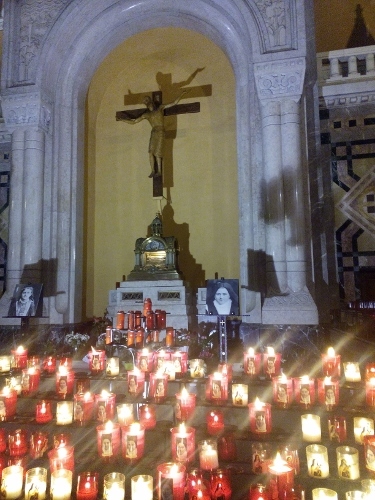 In Granada, we attended the Easter Vigil mass at the cathedral at 22:00 that lasted to 03:00hrs, no exaggeration. In Barcelona, we attended a 09:00hrs Sunday mass, with the lector as the only choir, and with barely 100 people in attendance, half of were tourists. In Toledo, we’ve gone into a small church to join in the rosary said in Spanish to my delight. Every single day in various cities in our itinerary was punctuated with a mass either in the morning, middle of the day, or in the evening, whenever possible. When walking around the city, she would always drop by a church, big or small, with or without entrance fee to say a short prayer. Similar to yours, our holidays in Europe were not only sightseeing per se, but also both cultural and religious experiences. Hello Gerry, we were in Santiago last Nov. 18. Stayed there for 3 days and of course heard the mass. Sound like you had a grand time touring in Europe. Spain is aldo our fave but unlike you, we prefer to live in the south. I just have to be near the sea! We are hoping we visit Segovia, Avila and Toledo this time. Funny we were in Sevilla also last April just before the feria. We just arrived now in Portugal on our way Also visit Fatima then it would be our 3rd time. You guys are lucky living in one of the safest place on earth. I heard Vancouver is a nice place to live, but a bit expensive for us I think thanks again for stopping by. I hope you get your Camino bday present. That would be really awesome! Cheers.. Hans and Dines. Good to hear from you, two. Enjoy your Portuguese experience. Fatima’s a great place for retreat/prayer and is less commercial than Lourdes although I like the set-up in Lourdes. Lisboa is charming but to me, it looks “tired and haggard”. I remember that I made the mistake of telling my Brazilian co-worker “that Portugal is a poorer cousin of Spain”. Her face dropped and it was then that it dawned on me that I was talking to the wrong person :-))). By all means though, it’s true; Spain is more developed than Portugal or maybe am just partial for Spain. Anyhow, we lost our camera in Sevilla. Our memories of Portugal were gone except for a few photos that we took with our cell phones. My wife and daughter were sitting on the bench in the plaza fronting the arzopispado (back of the cathedral) when I wandered around to look for some souvenir items. I may have taken it off my neck and put it somewhere when I was loading the items into my backpack. We realized that the camera went missing after about 10 min that I rejoined them. I went back to the store but I didn’t find it. It was Viernes Santo and Sevilla was our first stop in Spain. So you can imagine how I cursed myself on that holy day. Part of me died when that happened. For sure, there was a deeper spiritual message that the Lord wanted me to reflect on. Not to dampen our Spanish trip, we got a smaller camera when we got to Cordoba the following day. Lo and behold, the camera only “speaks” Spanish but we were able to figure-out how to make it work! Reflection: heartache is always followed by a glorious consolation. Have a safe travel to you, two. Hello Maureen…thanks for passing by. I could say i am a Theresian child. I am so moved by the simplicity and holiness of the Martin family. We did come back to Lisieux end of April this year and paid our respects to the saints. Greetings…. Thank you. Please let me know what you think of http://louisandzeliemartin.org Thank you. I couldn’t watch the video yet as we are currebtly on the road agsin. But i’ve read the description and it was all familiar…Nice…. Perhaps I did not make clear that the link is not to a video but to a comprehensive Web site about Saints Louis and Zelie which includes a photo gallery, many videos, and many articles, homilies, conferences, and prayers about them, their spirituality, the miracles which led to their canonization, and their influence. Since you are so devoted to them, I do believe that it will be of interest to you. Please, when time permits, visit it and let me know what you think of it. Thank you.